Elizabeth Brackett was a world champion triathlete, a dedicated teammate and most importantly, our friend. On Wednesday, June 13th, Elizabeth was doing her morning recovery ride along the lake front path and was involved in a bike accident. She passed away later that week surrounded by family and friends. She was 76. The entire Well-Fit community has been mourning the loss of our teammate and friend. 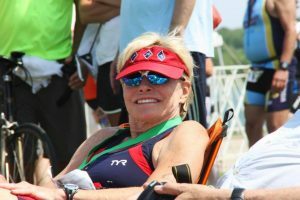 Elizabeth was a dedicated athlete and a daily inspiration of what it takes to defy aging. She showed up to the gym ready to work, never made excuses and pushed to better herself every day. She stood on top of the podium so many times, showing us that age could not slow her down. She was a champion in every sense of the word and we will miss her spirit here at Well-Fit. In honor of her memory, the Lake Zurich triathlon will be dedicated to Elizabeth. It is a team race for Well-Fit and we will be ordering shirts and collecting donations for the USAT Foundation, whose mission is to support and promote triathlon and open pathways to the sport to those whom it might not otherwise be possible. If you have not signed up for the race yet, registration is still open.